'The duke has decided to call it a day' Jump to media player The BBC's royal correspondent Nicholas Witchell on why the Duke of Edinburgh has decided to retire. 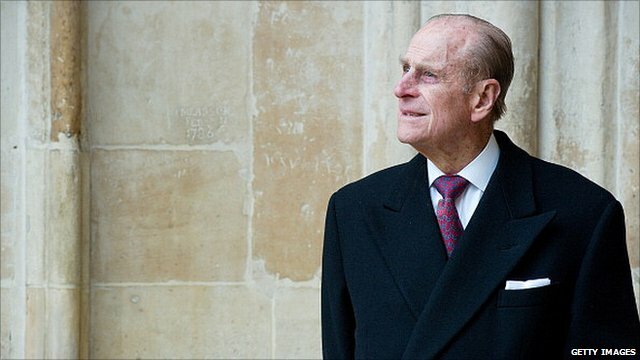 Prince Philip on whether he is a 'green' Jump to media player The Duke of Edinburgh explains how he sees the difference between conservation and people who 'simply love animals'. 'Fitting tribute' to 'guinea pig' airmen Jump to media player The Duke of Edinburgh unveils a tribute to the Guinea Pig Club at the National Memorial Arboretum. How Prince Philip flew 'Turbulent' Jump to media player It is hoped young people may be able to help with the restoration of a plane flown by Prince Philip in 1959. Prince Philip swears during photocall Jump to media player Prince Philip swears during a photocall at a Battle of Britain event at the RAF Club. Campaign to save 'Queen's' Malta church Jump to media player The cathedral where the then-Princess Elizabeth worshiped when she lived in Malta is in need of renovation. Toddler reluctant to meet the Queen Jump to media player Alfie Lunn wriggled as he met the Queen at unveiling of a memorial to the Afghan and Iraq wars. The BBC's royal correspondent Nicholas Witchell speaks to Victoria Derbyshire about the Duke of Edinburgh's decision to retire.